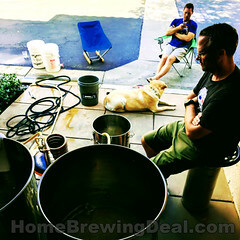 MoreBeer.com Coupon Code Description: Act fast and pick up a new RoboBrew Electric home brewery for just $299 and get FREE SHIPPING! If you want to jump into all grain brewing right from your first batch, or as an upgrade from malt extract brewing, the Robobrew is a complete turn key solution. 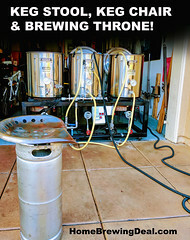 The Robobrew is an all-in-one electric brewery that has built in elements for heating and boiling, an onboard water resistant control panel for setting and monitoring temperatures, a removable grain basket, and a built in spigot for transfering. It is extremely portable and uses 110v power so it can be used nearly anywhere. The Robobrew features dual heating elements run off of a single 110 volt plug and have individual switches allowing for more control over the heating process. One element is 1000 watts and the other is 500 for a combined 1500 watts! Use both when you need to ramp up the temperature quickly either at the start to get to your mash temp or to go from your mash temp to boiling. Use only one of the elements when you want to hold a temperature.The digital control panel makes it easy to see the current temperature and set the temperature you want. You can also set a delayed start of up to 23 hours in advance so that you can have your water hot and ready to go when you get home from work or get up in the morning. The digital controller is also water resistant so don’t worry about spills or some water dripping down the side. This controller is built for brewing! 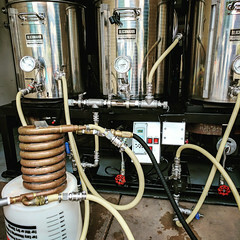 The RoboBrew electric home brewery also includes a stainless steel malt pipe with false bottom allowing you to easily shift from mash tun to boil kettle during your brew day. 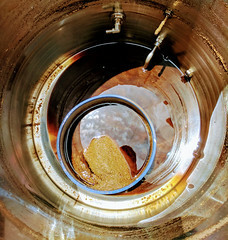 The malt pipe includes a handle to lift it from the RoboBrew and tabs at the base so you can set the malt pipe over the RoboBrew to let the wort drain out. It also has feet at its base to raise the malt pipe slightly off the base and help prevent clogging. Here are some of the features of the RoboBrew electric home beer brewing system.